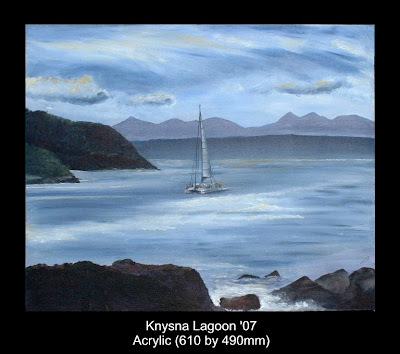 This painting is based on a photograph of the Knysna lagoon taken from a vantage point near the Heads. There was a lot more activity on the lagoon in the photograph. I prefer the simplicity of a solitary boat, which is reminiscent of a less frantic era, before the tourist boom. Bloody nice. Can't believe the Knysna Heads are basically owned by William Smith (the guy who teaches math on the TV). Thanks. Yes, we always see him at the waterfront whenever we are there - he was a very good maths teacher!